Greater than 10 minutes, my friend! This is the third post on online marketing strategies for SMB. The first part covers tools for improving your search ranking. And the second is about building your content strategy. Next comes content promotion. Here, social media for small business can be a powerful way to amplify and reinforce your carefully created content. Nearly every online research begins with search engines. More than a half of potential customers research businesses using social media before making a purchasing decision. Social media is free and it lets you talk to customers anywhere. So how can you use social media to its advantage? 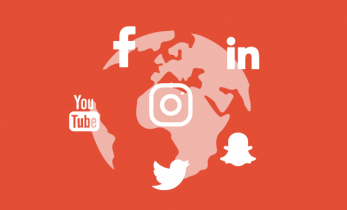 To effectively cross-promote your content, you can’t simply post the same message on each social network; you need to tailor it to fit each platform and audience. When promoting a blog post or a campaign, you may need to address your Facebook fans in a different way than your LinkedIn audience. On Twitter, you have to keep your message short and simple. Here’s a look at three top social networks with some marketing tips and tricks. 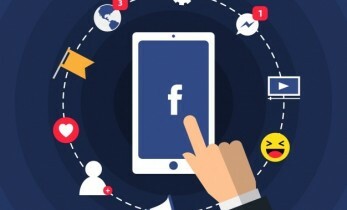 Your Page establishes your business’ presence on Facebook, so people can find out about you and connect with you. Commit to your personality: share your knowledge, talk about your experiences, and interact. 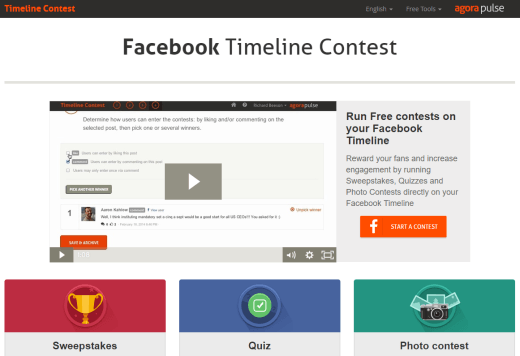 The cover photo is an area for some promotion of your business, your contest or giveaway. The cover page loads fastest as an sRGB JPG file 851 x 315 pixels and less than 100 kilobytes. Facebook posts can be up to 10,000 characters but be sure to put the main message into the first 480 characters as only they show up in the feed. Update the Page template to best suit your business (Settings > Edit Page > Edit Template). You can choose Business, Services, Shopping, Venues, Politicians, Restaurants and Cafés, or the Standard template. Complete your About section as it often the first place your visitors scan after a Google search. 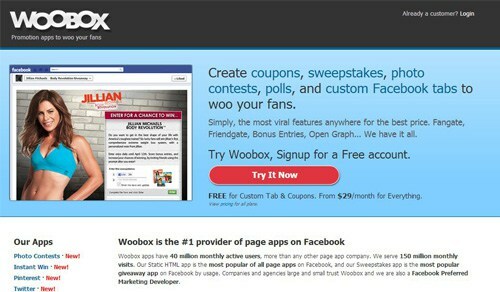 It’s your landing page for Facebook. Your short description, the one line pitch, is your value proposition or unique selling point. Add your social links and contacts. Add relevant keywords to your About section for better SEO. Only the first 75 characters will appear on your wall, and they are most valuable for search engines. Include a link to your website in those first 75 characters. Add relevant keywords to your posts and to captions of your Facebook images. Be responsive to messages and comments but note that you can set you Response Time marker automatically OR manually (Settings > Messaging). To receive private messages in addition to comments, enable the messages feature in Settings > General. Enable Response Assistant to respond automatically with a customised message (Settings > Messaging). Take advantage of call-to-action buttons available for a Page (the bottom right-hand corner of the cover photo). The buttons make it easier to get in touch with the business. Customise your tabs of the left side bar (Settings > Edit Page > Tabs). Drag and drop tabs to change the order and complete all the information. Make good use of custom Facebook tabs. 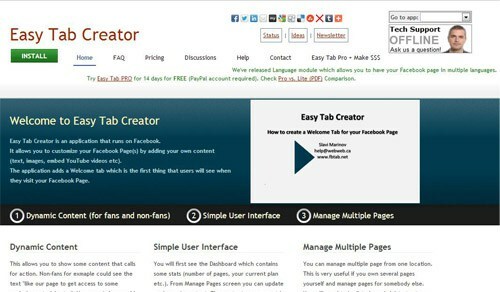 You create a custom landing page right on your page for almost any purpose. Get more subscribers to your business blog. Promote registration for your upcoming event. Experiment with different post styles and types. Your posts are meant to be marketing tools! Facebook Stories are in-the-moment content clips that appeared only in 2017. Give sneak peeks into industry events, product launches, and behind the scenes content with Facebook Live. If possible, embed your Facebook content into blog posts or other online publications. Click in the upper right-hand corner of your post, copy, and paste. Don’t forget your past successes. Recycle or repost past successful content to save you needed time and energy. Some of your readers did miss the posts that performed well in the past. To find most popular posts on your Page click on the Insights tab at the top of your Page, and then go to the Posts section on the left hand side. To see which posts were reaching the most users, click Reach in the top menu of the table. To see which posts were getting the most engagement, click Engagement in the top menu of the table. You can sort engagement even further by Post Clicks, Reactions, or Comments & Shares. Have fun and be social. Facebook was created to connect individuals around the world. Your Facebook insights will tell you when the majority of your fans are online, so you can adjust to the time periods they prefer. A professional business network, LinkedIn can be used to share content about your business or industry sector. It’s also useful for networking and establishing closer contacts. LinkedIn has 3x higher visitor-to-lead conversion rate then Twitter and Facebook. It’s sure a place to increase your marketing presence, build new relationships with customers and form your professional network. The cover photo is one more way to brand yourself. You can connect it to your profession, tell a visual story or share your best contact info but be sure that the image represents you as a person and a professional. The new recommended size is 1584 wide by 396 high (4:1). On the new user interface only a small piece of your summary is displayed. Concentrate on the first sentence to grab the attention of your visitor. Try “view as” mode for your profile to check the result. Beware of buzzwords when filling out your profile or a business page. Every year, LinkedIn releases a ranking of the 10 buzzwords on profiles which are used so often they become almost meaningless. This year’s adjectives are: specialised, leadership, focused, strategic, experienced, passionate, expert, creative, innovative and certified. Instead of using buzzwords, add keywords to various sections of your profile including your headline, your summary, or your work experience. LinkedIn is one of the top sites that Google indexes regularly so your SEO is relevant for headline, summary, job titles. Use keywords that people use when they’re searching for the services in your niche. Think in terms of 3-5 words to avoid overstuffing. Rename images on your profile adding keywords: include a name that will get you discovered online to gain more exposure. Make use of backlinks: add a link to your blog page and consider linking back to your profile page for a higher profile ranking. You can also turn your post or presentation into a document on SlideShare as LinkedIn has bought the platform and integrated SlideShare into accounts. Feel free to share your blog content in appropriate groups as well, but use different text and post on different days and times. Share your blog posts in LinkedIn with an image and a link. 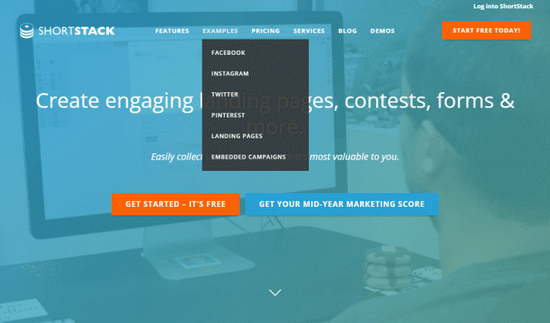 Keep the description copy to 70 characters and feature a call to action. Everything after 100 characters will be truncated and likely have a negative effect on engagement rates. If you choose to report key industry news and trends, try to add value and provide key insights and takeaways. Make your text personal and engaging. Your audience consists of individuals, not institutions and entities. 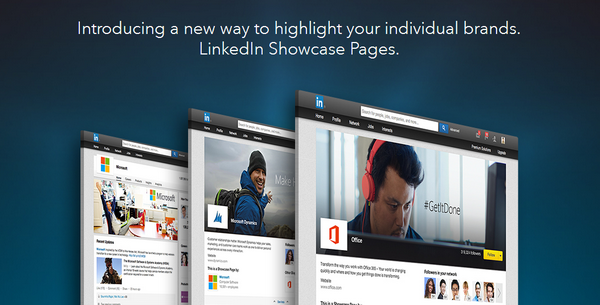 Showcase pages on LinkedIn are extensions of a Company Page. They can be used to promote a product or business initiative. In fact, such niche page for targeted segments can serve as a specialised landing page connecting to your website. You can offer different products or services on the separate pages linking them to your main page. It’s a great way to address various target audiences while continuing your work on brand building. LinkedIn was created for networking. Get into the habit of following up meetings and conversations with LinkedIn connection requests – it’s a great way of keeping your network up to date and relevant. The blueprint for writing an undeniable LinkedIn connection requests comes down to four rules. Your request must be: polite, personalized, professional, and (yes, right) praiseful. Some useful tips on writing LinkedIn requests were published by HubSpot and the Muse. Make use of search functions when looking for new customers. Instead of the Advanced Search function, the new version offers a multi-layered search with the support of AND, OR, NOT Boolean phrases. You can further refine the global search with the filters on the right-hand side of the page and save the search and get regular updates. Here is your LinkedIn search guide. After searching for your ideal clients or partners take advantage of your ability to send up to 15 free messages per month to people that share a LinkedIn Group in common with you. Your 15 messages are collectively for all of your groups each month. Unsent messages don’t carry over to the next period. The limit includes messages sent directly from groups including messages to your 1st degree connections. If you post articles to LinkedIn Publisher, you can see people who liked or commented on your posts. 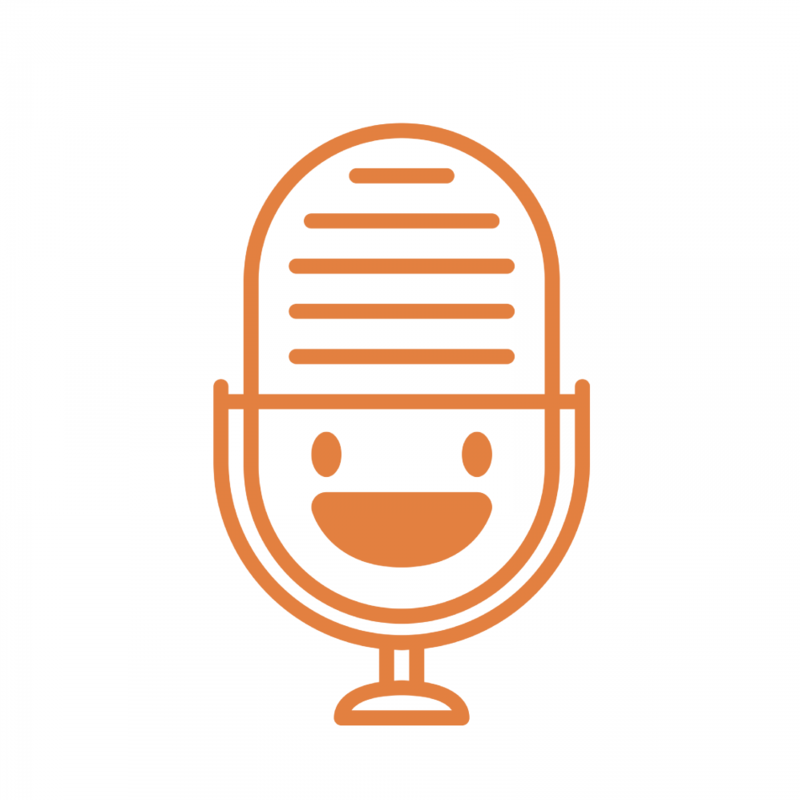 These people had a positive interaction with your content and have some idea of who you are, so they may be your potential prospects and connections. In recent years, Twitter has been in a slow decline as its original appeal isn’t as exciting as 11 years ago. Despite that it is still a valid communication tool for reaching almost any type of audience. Being one of the top social media sites in the world, Twitter is meant for building a dialogue with its real-time, quick-to-read updates. It allows you to listen to people and join in with their conversations. In September, Twitter started testing 280 character limit to give posts more space. Nevertheless, it remains at its core a short message service. Avoid aggressive selling, excessive self-promotions and retweets cluttering fan feeds. If you are eager to try lengthier messages right now, here are some suggestions on using Twitter new 280-character format. You have 160 characters for you bio field on Twitter. Do keep it brief and include links to other websites and pages instead. Make sure you use http:// at the beginning of your links for these links to be clickable. It was the first social network to introduce hashtags and @ handles for better search and networking. Hashtags make your tweet more searchable and @ handles are used to give credit to or message other Twitter accounts. Use tags (but not abuse). If you add three or more hashtags in your tweets, they look like spam and are a lot harder to read. Write shorter updates and leave room to include via @YourUsername if someone wants to share your content. The lifespan of a tweet is about less than 20 minutes. If you share your blog posts, do it more than once on different days and at different times. Post your evergreen content every couple of months mixing them with curated content and retweets. It’s fine to repeat Tweets more than once over a day if they are relevant and timely. Twitter internal data shows B2B audiences are much more likely to engage on Twitter after seeing business’s message for several times. To get more retweets, be sure to include images and links. Avoid posting news without relevant links. You can upload up to four images to any tweet excluding animated GIFs when posting from an event or destination. Just tap on the Camera button and select up to four images. 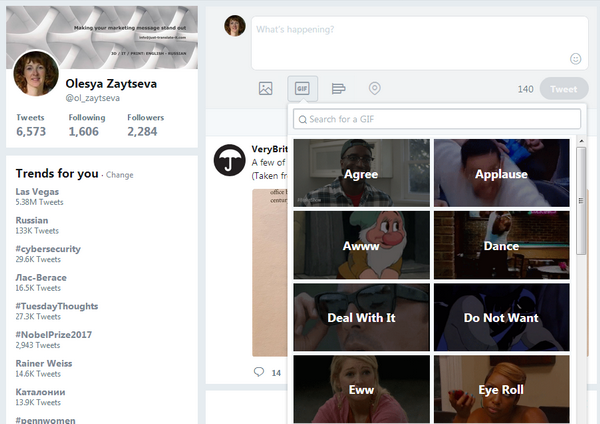 Twitter even allows you to search for GIF’s while composing a new tweet to enhance your post with visual content. You can also use images to get past character limit if you attach a screenshot with some text or notes. You can now retweet your old tweets if they are relevant again or you feel they have gone unnoticed. Please note that each tweet can be retweeted only once to reduce the clutter in users’ newsfeeds. Do not forget to promote your best tweets through a Pinned Tweet and stick the compelling content at the top of your page. Rotate the slot every few weeks to keep it relevant. Use lists actively to organize and curate content. Main stream of latest tweets contains too much information. Even basic tools like Tweet Deck can be of great help here. Some ideas for your lists: influencers, customers, leads/prospects. Feel free to make some of your lists private. Note that anybody can view a public list and users receive notifications when you add them. Try to maintain consistent communication and include similar keywords you use on your website, if it goes with what you’re tweeting about. Remember that hashtags play the role of keywords for Twitter. Analyze which hashtags bring you the most engagement and optimize your profile by focusing on the more effective ones. Note that you can tag up to 10 people in a tweet image. This means you can add up to 10 @ handles without affecting your character limit in the original message. 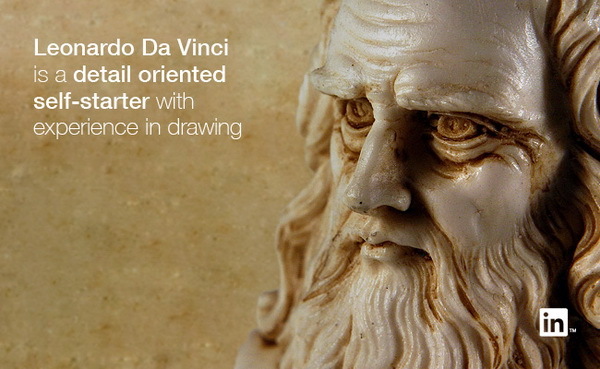 Don’t miss a chance to embed tweets into websites as an embedded tweet is intuitive. Anyone logged into Twitter can reply it, retweet, add to favourites. To embed a tweet tap on the More (…) button below the tweet, select the Embed Tweet option, then copy and paste the embed code into any HTML document. 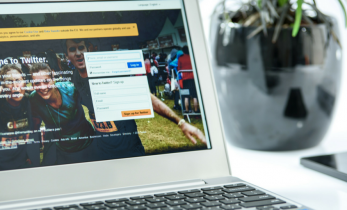 Keep your name and @ handle consistent across all of your social channels to make you more searchable. Avoid using numbers in your username because it might seem spammy to Google. Keep your pages regularly updated if you have them. Inactive social media accounts and unanswered queries could seriously harm your business. It just looks as if you don’t care. If you’re a business with visual products, having a presence on Pinterest and Instagram is crucial. But you should focus your marketing efforts only on 1 to 3 platforms. The number of followers and likes you have is going to mean less and less. It’s time to look at engagement. Find out what your audience wants to read, teach how to do something, inspire as people want to be inspired. New posts by email. Never miss a thing! Interested in new posts? Join the mailing list to receive monthly updates. An independent translator working with English, Ukrainian, and Russian. Marketing communications for technology companies: making your marketing message stand out. Olesya, thank you for the practical tips!